We currently have 3 dogs, all from local rescue sites and/or animal shelters: Leo the poodle mix, plus Stella & Peanut, our two yorkies. They are the stars of today's picture of the day. We've had quite a few dogs over the past couple of years. My wife Ana had a habit of adopting dogs from the animal shelters, getting them all their shots, plus spaying/neutering; then at some point, for one reason or another they just weren't a good fit with our family, so she'd end up finding them a (usually better than ours) home via Craigslist. I used to joke that maybe we should declare ourselves a pet rescue so I could deduct some of the costs on our tax return. Well for about the last year, we went from being a "pseudo" pet rescue, to actually working with a couple of them. For a while after I came home from Afghanistan last spring we actually didn't have any dogs in the house. But then our neighbor behind us decided to foster a couple of dogs from a Killeen rescue that she found on Facebook: More Paws 2 Love. Before I knew it, Ana was asking me to help her fill out foster and adoption applications. Over the next couple of months, we fostered a couple of dogs. 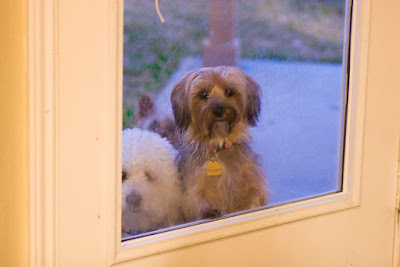 Then in the fall, while I was in Arizona, Ana fostered Peanut (looking in the window in the picture above), then decided she wanted to keep her. I made her verbally agree to the same conditions as with Leo ... no more "temporary" adoptions in the Morris house. Finally, about a month ago, Ana discovered yet another local rescue: Tails of Happy Hearts. And that's where she found Stella (who you can barely see in the background of the picture). She's a full grown yorkie who weighs around 2lbs. Officially, I think we're still just fostering her, but I've got $150 in my wallet right now in case the lady who runs the rescue contacts me to make the adoption official before Ana gets home from Seattle and can do it herself. That gets us up to 3 (small) dogs, which I think is enough for now. If little Leo, the poodle ever comes up missing, don't come to my house looking for him/her, LOL. He/she is a real cutie. I had a tiny toy black poodle once, the most precious thing I had ever seen, except for a baby. He slept with me, followed me everywhere I went....outside to play, to neighbors house, visiting friends. I guess about everywhere except to church, lol. One winter afternoon he wanted to go outside so I thought what would it hurt, he has his little sweater on and it will keep him warm. Normally he would go out for just a few minutes to use the bathroom, per se, then come back and scratch on the door wanting back in. After about 10 minutes, he never showed up so I got in the car and drove down my street to see if I could find him. He was laying in the middle of the road dead....someone hit him and never bothered to come tell me what happened. I love dogs, but I haven't had one since he got ran over. A friend from Dover Elevator gave him to me because she knew I would take good care of him. Her husband had to transfer to another city is why she needed to get rid of him. We lost contact with each other and I never got to tell her what happened to him. But it's probably best she never knew. His name was Quincy. I had my neighbor build a box to put him in and buried him on the back of my property. I made him a little tomb stone out of a concrete block and painted his name, birth date and death date on it. I kept flowers on his grave for a few years, then got really busy with work, house work among other things and that soon faded away. Until this day, I still miss him. It's really strange how attached you get to animals and love them almost as much as children. Take care of Leo, Stella and Peanut. They are precious little dogs and I'm sure your chldren will learn to love them like their brothers. Thanks for sharing this story with me/us. Brought back some good memories to me. Take care and keep up the good work. I'm sorry about Quincy, but it sounds like you still have some really fond memories. Perhaps if you ever find yourself at a point where you have more time you'll be able to get another dog. If you do, I'd definitely recommend checking into rescue organizations there in Mississippi. Thanks for stopping by. Coming from the pound, we really don't know exactly what kind of dog Leo is. Some sort of poodle mix seemed like the easy assumption ... but you're right, he does fit pretty well with the descriptions and pictures of Bichon Frise too. Either way, he's a pretty chill dog. And other than his habit of taking himself for extended tours of the neighborhood should we ever leave the front door open (he seriously is impossible to catch if he doesn't want to be caught), he's really well behaved. Thanks Todd, I do still have fond memories of Quincy. I miss taking him riding with me everywhere I go and him sleeping beside me at night. He was a sweet, adorable Poodle. I love the color of little Leo. He's a mixed poodle, right? I've never seen a color like him. I get the girls love him. I've thought about going to check ou the rescue organizations in here in Mississippi. They have some cute, sweet little dogs there that definitely need a home. Why Do Little Kids Love Bandaids?